Eat In was the new name Welcome Break gave to their self-branded restaurant. Unusually for a service area, they were initially keen to promote it, but they then went in the very opposite direction and removed it in favour of fast food options. In 2001, The Granary, a name which had been around for a long time and withstood many criticisms of service station catering, was removed from Welcome Break services and replaced by Food Connection. Initially it received impressive feedback. 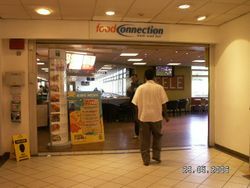 Like many motorway restaurants at the time, the Food Connection brand was deliberately bland as it tried to slot in alongside other facilities, including the Red Hen waitress restaurant and KFC. It described its offer as the "traditional fare", with hot and cold dishes and a salad bar. Food Connection usually stood next to a Coffee Primo stand. Inside one of the restaurants, with the old logo. In 2006 Welcome Break thoroughly refreshed their image, and as part of that Food Connection had to go. While at first Eat In seemed like just a new name and a new colour scheme, the new brand was keen to promote the quality of its food, with leaflets claiming promoting the flexibility of the menu and their tendency to cook-to-order. More importantly, Welcome Break were keen to throw money at it. As a motorway restaurant it attracted a number of criticisms, but still received generally favourable feedback. Offers included a free kid's meal with adult purchases, and cooked breakfasts for £1.99. Welcome Break were so proud of Eat In, in 2007 they signed a six-year contract to provide the catering at the Eurotunnel UK Terminal, and were reportedly looking at other non-motorway options including the French terminal. 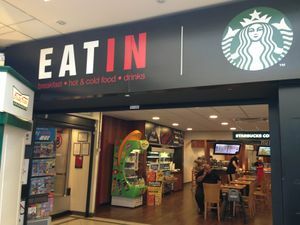 In 2012, they used Eat In to provide the catering at Extra's Cobham services. In 2008, Coffee Primo was replaced by Starbucks, meaning Starbucks products joined the menu at Eat In. Eat In had to tackle the same problem that all the other operators were looking at: despite every effort, increase in their menu kept declining. In 2012, Eat In was boosted with Papa John's Pizza providing the pizza range at the services. This tried to attract more attention to the restaurant, while at the same time causing the Eat In brand - which received a new logo for the partnership - to take a back seat. By 2013, refurbishments were tending to prioritise other brands over Eat In, leaving the restaurants looking increasingly small and tired. Later that year, Welcome Break announced their restaurants would be replaced by Harry Ramsden's, Papa John's Pizza and Subway. The removal took until June 2015. 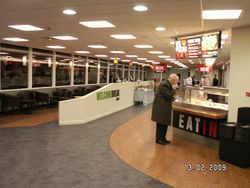 At Derby South services eastbound, the restaurant was not replaced, but most Eat In signs were removed. The restaurant at Derby South eastbound closed in 2018.